1) Without the root structure of a natural tooth present, the jawbone can shrink. 2) This shrinkage will make your face look older than it is. 3) There are no loose parts to worry about losing. 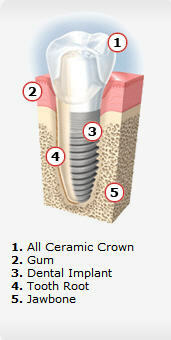 4) The dental implant is stable and comfortable. 5) No adjustment is needed after placement. 6) Normally, it will serve its owner for life.